When you want to keep track of more than one website on your Mac while browsing a second, third, or fourth site, you could open two (or three or four) separate browser windows with Safari. However, here’s a more handy way. 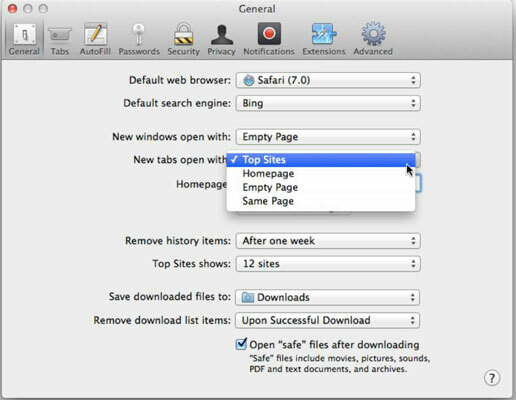 Safari and most other browsers offer a tabbed browsing feature, which allows you to easily jump around among multiple web pages in a single window. All you have to do is click the tab associated with the web page. When you load Safari, you see a single web page displayed in a window. To add a tab, simply click the New Tab button (the plus sign on the right), and then open a website by typing a URL or search term in the Search and Address field. Choose what type of tab you want to see when you click New Tab by going to Safari→Preferences and clicking the General button on the toolbar. Choose one of the four choices in the New Tabs Open With pop-up menu, as shown. You might like to open in the Top Sites display. If you turn on Safari in iCloud on your Mac and one or more iOS device, you can access tabs opened on one device from another. On your Mac, click the iCloud button on the toolbar to see the tabs open in Safari on your iPhone, iPad, or iPod touch, as shown in the figure. Open Safari and choose Safari→Preferences. Click the Tabs button on the toolbar. From the pop-up menu shown in the figure, choose when you want tabs to open instead of windows. ⌘-click Opens a Link in a New Tab: Rather than leave the current web page and replace it with the linked page, a ⌘-click will open the linked page in a new tab and leave the current web page open. When a New Tab or Window Opens, Make It Active: When you click the New button, the tab or window that opens becomes the active one.